Hematopoiesis is a tightly regulated process in which hematopoietic stem cells (HSCs) proliferate, differentiate, and then must survive in the periphery. NKAP is a nuclear protein shown previously to be critical for HSC maintenance and survival. NKAP also associates with histone deacetylase 3 (HDAC3) to modify chromatin structure. In this issue, Shapiro et al. (p. 2287) show that NKAP and HDAC3 must interact to regulate HSC survival and maintenance in a mouse model of hematopoiesis. Serial truncation analysis and alanine scanning were used to identify Y352A or F347A mutations in NKAP as critical for interacting with HDAC3, but these mutations did not change NKAP expression or nuclear localization. They used a linked conditional deletion/re-expression mouse model in which endogenous NKAP was deleted and an YFP-tagged wild type NKAP or mutant NKAP was re-expressed. Hematopoiesis was induced by poly-IC treatment in YFP-NKAP mice but not in mice expressing the Y352A NKAP. 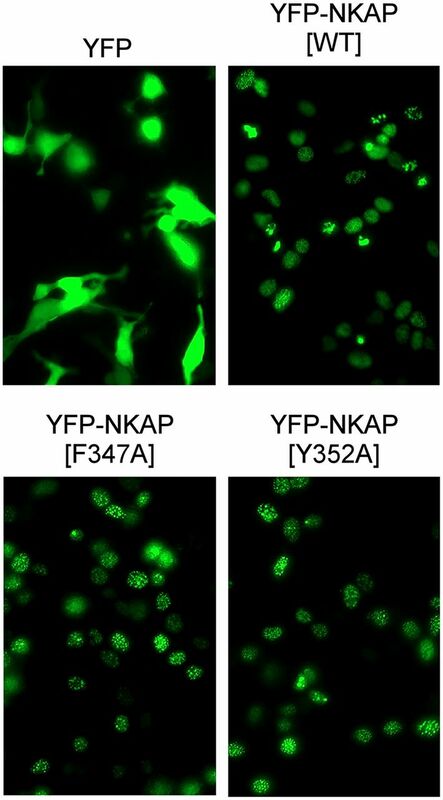 In contrast, proliferation occurred in murine embryo fibroblasts expressing Y352A NKAP. Together, these results indicate that NKAP association with HDAC3 is important for HSC survival and continuing hematopoiesis. 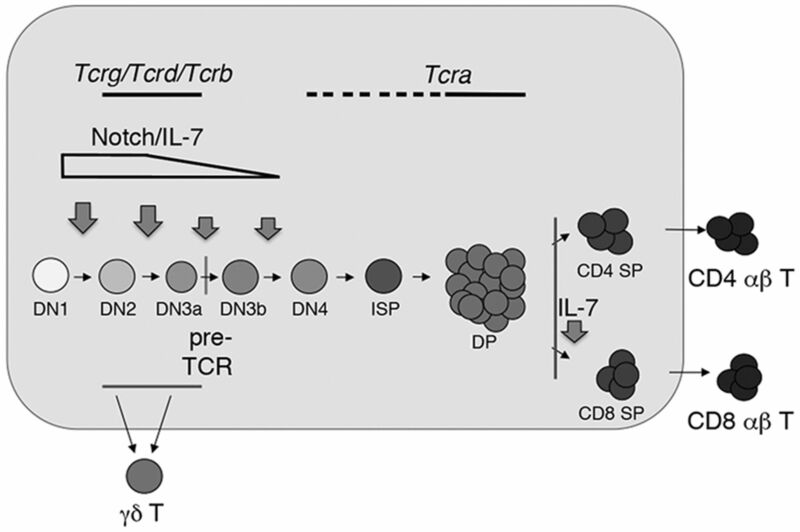 The early stages of T cell development, termed β-selection, involve a tightly regulated process in which pre-TCR expression promotes the transition of thymocytes from the double negative (DN)3 to the double positive (DP) stage. Pre-TCR expression requires Notch signaling for transcription and V(D)J recombination. Rodríguez-Caparrós et al. (p. 2460) now examine the role of pre-TCR dependent loss of Notch signaling in the downregulation of Tcrd and Tcrg transcription. They find that Notch signaling promotes Tcrd and Tcrg transcription through recruitment of RUNX1 and MYB to Eδ and Eγ enhancers in DN3a thymocytes. Pre-TCR signaling is known to inhibit Notch1 transcription, and in this issue they observe that decreased Notch signaling caused dissociation of RUNX1 and MYB from enhancers, leading to transcriptional silencing of Tcrd and Tcrg during β-selection. These data reveal how Notch signaling influences important aspects of gene regulation to drive thymocyte production of γ/δ T cells. In mice, regulatory T cells (Tregs) that secrete amphiregulin (AREG) and express IL-33R (ST2) play a role in tissue repair. Lam et al. (p. 2195) examined nonlymphoid human Tregs to determine if they also can contribute to the repair of damaged tissue. Unlike murine Tregs, those from humans do not express ST2 and were unresponsive to IL-33 signals. The authors engineered naive human Tregs (CD4+CD25hiCD127loCD45RA+) to express high levels of ST2 using lentiviral vectors. IL-33 enhanced proliferation of these ST2+ Tregs in a TCR-dependent manner, without a loss of their suppressive function. Treatment with IL-33 also shifted the gene profile of human ST2+ Tregs toward secretion of myeloid-regulating cytokines and T cell– and myeloid-attracting chemokines. Additionally, IL-33 alone dramatically increased the expression of AREG in ST2+ Tregs. Finally, ST2+ Tregs downregulated expression of Ag presentation–related molecules on monocytes in a Treg:monocyte ratio–dependent manner. Taken together, these data suggest that Tregs modified to express ST2 may be used to develop cell-based therapies for tissue repair. 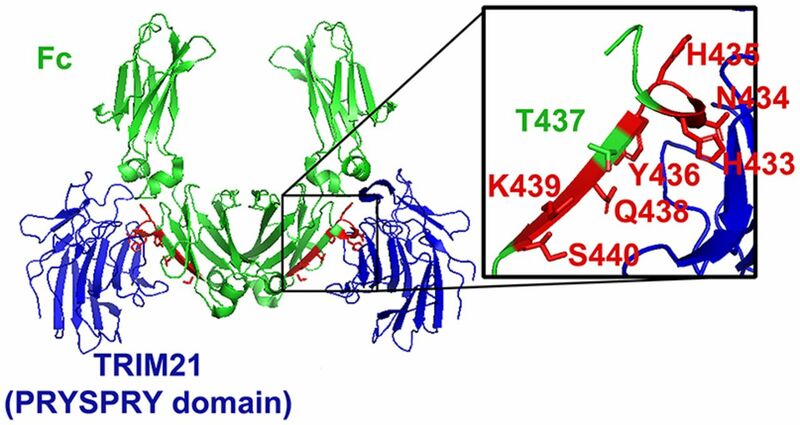 Tripartite motif-containing 21 (TRIM21) is a ubiquitous cytosolic protein that binds to the Fc region of Abs when an immune complex enters the cell. Ng et al. (p. 2307) demonstrate that increasing the binding affinity between TRIM21 and the Fc region of human IgG increases cross-presentation on human monocyte-derived dendritic cells (moDC). MoDCs cultured with immune complexes formed with the high-affinity Fc showed a significant increase in maturation markers and Th1-associated chemokines compared with moDCs cocultured with unmodified Fc regions. Incubation of moDCs with immune complexes containing modified Fc regions also associated with greater CD8 T cell expansion. Importantly, CD8 T cell expansion was shown to be Ag dependent. Thus, the new system has the potential to enhance vaccine efficacy through increased cross-presentation and enhanced CD8 T cell response. Adipose tissue (AT) contains a variety of immune cell subsets that can mediate inflammatory responses associated with obesity and insulin resistance. Previous studies have shown that mice lacking MHC class II (MHC II) expression on myeloid cells (mMHCII-/-) are more insulin sensitive compared with wild-type (WT) mice when given a high-fat diet. In this issue, Blaszczak et al. (p. 2451) examine how the absence of MHC II expression on AT macrophages (ATMs) affects Ag presentation and T cell responses. They observed that macrophages from mMHCII-/- mice are less inflammatory than WT mice upon LPS stimulation in vitro. In coculture experiments, the absence of MHC II on myeloid cells and adipocytes rendered them unable to generate regulatory T cells due to defects in Ag presentation. In addition, small interfering RNA–targeted downregulation of MHC II in ATMs resulted in a shift toward less inflammatory macrophages and greater insulin sensitivity in WT obese mice fed a high-fat diet. These results improve our understanding of how Ag presentation by ATMs influences inflammatory responses and insulin sensitivity.